because the zippers didn’t work anymore than he did. to my mother’s whispered bye. in his jacket pockets, his bristled jaw clamped. till he tore open the blue envelope. that’s all they give me. Father told the man in the tie. into the grey beyond our walk. Poem by Lowell Jaeger from "Suddenly, Out of a Long Sleep." box of war relics in tow. will never have to go. His knuckles whiten on the knife. Stole it off a dead Hungarian. the sheath from his belt. my dad were making this up. 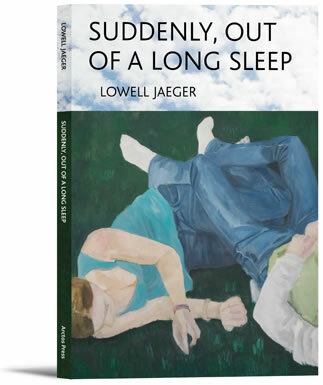 Among my favorites in Lowell Jaeger’s Suddenly, Out of a Long Sleep, are the poignant poems to his father, a blue collar worker of the 50s – 60s, laboring long and deadly hours in a mill, ruining his health to feed a family living on the edge of poverty. Jaeger’s concise and precise language isthe piston that drives deep the emotion. The tone often recalls anotherMontana poet, Richard Hugo. In poems like “The Knife” and “You Ask”Jaeger’s imagery lifts everyday incidents into the realm of what Rilke termed, “a tenderness toward existence.” These poems of compassion and awakening sing a truly American story. Lowell Jaeger was his grandmother’s “king of unspoken thinking,” and in Suddenly, Out of a Long Sleep he remembers, re-imagines and speaks to us of the “nameless art of lives entwining.” In poem after vivid poem, withcraft, dignity, and humor, he gives us the details, images and emotions that shape a life. This is the book of a son, a brother, a husband, a father, and a poet doing poetry’s good work. Lowell Jaeger teaches creative writing at Flathead Valley Community College in Kalispell, Montana. He is the author of many books of poems, and his works have appeared in a wide variety of literary journals, including Poetry, Antioch Review, The Iowa Review, Mid-American Review, Poetry East, and Connecticut Review. He is the recipient of fellowships from the National Endowment for the Arts and the Montana Arts Council. He lives in Yellow Bay, Montana on Flathead Lake with his wife, Amy, and their three teenage children.